Why invest in direct mutual funds on Coin? @nithin can you give me quick few reasons on why I should be investing in mutual funds through Coin? Coin Charges vs. earlier platform? How does coin subscription fees of Rs 50/month work? How do I start investing through coin? Debt fund and equity fund , what is the difference? What happens to my MF investments on mf.zerodha.com? can you give me quick few reasons on why I should be investing in mutual funds through Coin? It is the exact same fund, same manager, same stocks, same everything. But check out the expense ratio of the two plans. Regular has 2.36% and direct has 1.06%. Running a mutual fund is a business. Business has to earn. The way they earn is by charging the total AUM (asset under management) an expense. This expense is charged to the total AUM of the fund on a daily basis. So if today it is a Rs 1000 crore AUM fund, if expense ratio is 2%. Then 2% of 1000 crores divided by 365 (to calculate 1 day expense) or Rs 5lks is taken out from the total AUM by the AMC for running the fund today. The expense ratio for regular funds is higher than direct because the AMC marks up the distributor commission also. The distributor has to earn for introducing the clients right? And yes he earns upfront and as well as trail every year as long as the person whom he introduced stays invested. Check this link on how much distributors earn. Getting back to the Birla example, the expense ratio for regular is 2.36% and direct is 1.06%. What this means now is that if you had invested in direct plan 1.3% lesser would be reduced as expense from your investment. This 1.3% might seem small, but if you held your investments long term this will be humongous. If Birla top 100 gave 15% return for next twenty years, SIP of Rs 10000 in direct would be worth Rs 1.5 crores and regular would be 1.3 crores. Direct a whopping 20lks more because of the lower expense ratio. But a point to be noted is, there are few distributors who bring in a lot of value on the table by advising right things to do. You can’t dismiss that just because you have to pay higher expense ratio. Direct makes sense if you know which mutual funds you want to buy and don’t need any advisory help. Why direct mutual funds on Coin? 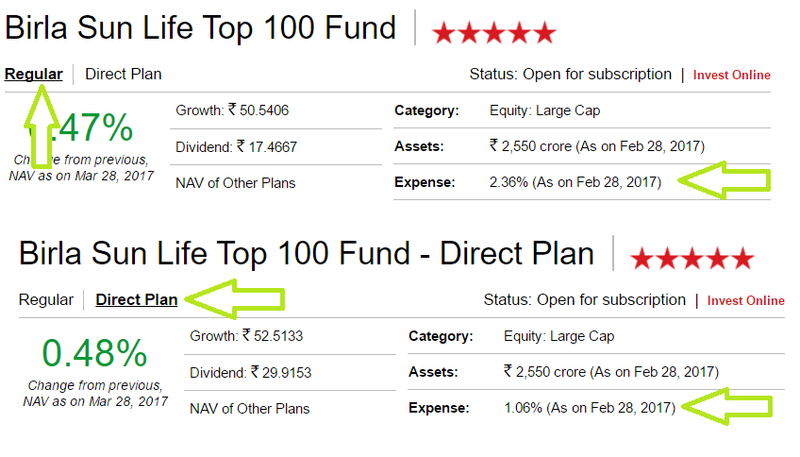 Currently, the way to buy direct mutual funds is to visit the AMC/fund house website or office and directly invest. Different portfolios for different AMC’s, getting a common account number (CAN), cumbersome setting up SIP process, generally quite inconvenient. Hence coin. Coin offers investing in direct mutual funds (we earn 0 commission from your investment) with the convenience of being in demat. So single portfolio across stocks, MF ( over 31 AMC’s and 2000 funds), ETF’s, Bonds etc. Easy SIP, start stop whenever you want without any NACH requirement. Increase or decrease SIP values at will. NAV tracking orders. Similar to stocks, place orders to purchase or redeem funds based on NAV. MF in demat form and hence fungible. Extremely easy to pledge and take a loan against in case of emergency. Single capital gain statement, P&L, visualizations, and more. MF or stocks in demat are much easier to claim by dependents (nominee of demat) in the case of death. Direct plans with multiple AMC’s would mean multiple folios, difficult to aggregate and claim. This guy is overstating the dangers of MF in Demat form? Thanks Team for this great initiative. I have a question regarding from where the funds for the MFs are going to be debited. Usually with a distributor I have a ECS Mandate and the debit would happen from my Bank Account. On the basis of SIP dates. How is the same going to happen in COIN? Via my Kite Funds or Bank Account? If the MF is held in the form of DEMAT, does that mean, it is similar to smallcase, wherein we have shares of individual stocks that are part of that MF? If yes, does that mean, when you exit this fund, we incur demat charges? How is the same going to happen in COIN? Via my Kite Funds or Bank Account? The funds will be debited from your trading account. If the MF is held in the form of DEMAT, does that mean, it is similar to smallcase, wherein we have shares of individual stocks that are part of that MF?If yes, does that mean, when you exit this fund, we incur demat charges? Yes, your mutual fund units are held in demat form. When you redeem your mutual fund units you incur a DP charge of Rs 5.5.
smallcases similar to a mutual fund is a basket of stocks, but unlike mutual funds, there are no AMCs, fund managers and other ensuring charges are minimal in smallcase. consider there is a 1% difference in expenses ratio of regular and direct MF’s, at what amount invested yearly be someone at profit by paying 600 i.e at what amount invested the extra 1% expenses ratio starts hurting me more than 600 rs a year ? at what amount invested the extra 1% expenses ratio starts hurting me more than 600 rs a year ? Assuming 1% upfront and 1% trail every year. At Rs 30000, you would have paid Rs 300 as upfront and Rs 300 in trail at end of the year. With us, after your Rs 25000, you would have started paying Rs 50/month. Also with mutual funds, you shouldn’t look at your investment value, but at the current value of investment which can keep going up. Understood direct mfs. But is this any different from buying a direct Mf in another online broker like ICICI Direct? Basically do i benefit monetarily by buying it from Zerodha instead of ICICIdirect? ICICI and 99.9% of them out there are distributors. They are not selling direct MF. Check this link, ICICI is one of the biggest distributors in India. They earn over Rs 300 crores every year as commission from fund houses. Nicely explained!! I have a question though. Few online distributors offer different types of SIP investment like Flexi SIP and Value Investment Plan(VIP) wherein an amount in a range is invested in MF depending on that month’s NAV. Will Coin offer these (or at least some of these) facilities? On your above illustration , it seen there is a difference on NAV value. Where direct fund NAV is higher on any day. So, I will be getting lower unit in direct fund compared to regular fund. It should some how adjust the higher expense ration. can you explain please. When one fund is charging more for managing your money, you expect low value of fund per unit of fund as compared to one which charges more. Can you list the different types of charges involved while transacting mutual funds in demat form ? 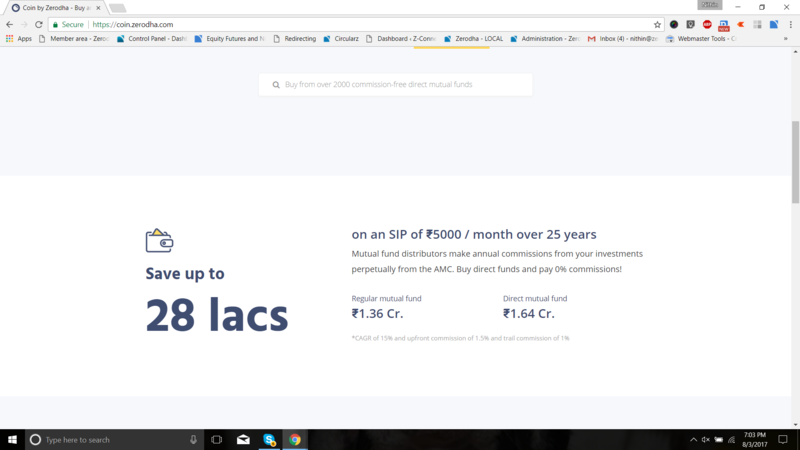 If I am investing ₹5500/month through SIP for 3 years, how much would I save using coin (accounting in ~₹900/year Zerodha charge - ₹300 AMC + ₹600 for MFs)? Additionally, would I be able to track my MFs all in one convenient summary screen like IIFL provides? On an average a saving of around 1% per year on your portfolio, this can be upto 1.5% on certain funds. We had done a math with assumptions as mentioned in the image below. If you hold your investments for a long term, this can be quite a bit. Numbers specific to my situation (as detailed in my previous post). Mutual fund summary screen similar to what IIFL provides, so that I can track all my MFs on one screen. Please reply with appropriate considerations. If I can have significant savings, I would most definitely shift my whole MF portfolio over to Zerodha-coin. @BhushanDhamale Look at the expense ratio for each of these funds in both the direct and indirect mode. For direct, you can check here and for regular here. The difference in expense ratio is the yearly saving you make. Now use a compound interest calculator and mention the % return you expect. See the final return you make from the regular fund. Now add the difference in expense ratio to this expected return and see the final amount. The difference is your savings. I will try to get a calculator done for this at our end.